Ida P. Rolf earned a Ph.D. in biochemistry from the College of Physicians and Surgeons of Columbia University in 1920. During the following 12 years, she worked at The Rockefeller Institute in the Department of Chemotherapy and later in the Department of Organic Chemistry. During her time at the Institute, she took a leave of absence to study mathematics and atomic physics at the Swiss Technical Institute in Zurich. Interestingly, this university is one of the top technical schools in the world, with 31 Nobel Prize winners including Albert Einstein amongst its graduates. While in Zurich, she also took the opportunity to study homeopathic medicine during the weekends in Geneva. Driven to find health solutions for herself and her two sons, she spent many years exploring alternative healing methods including homeopathy, osteopathy, chiropractic, yoga, the Alexander Technique, and Korzybsji's work on states of consciousness. Throughout her explorations, Dr. Rolf was grounded firmly in the scientific point of view, but also acknowledged the value of solutions arrived at through intuition. She observed that lasting improvement and an overall sense of well-being, required examining the effects of gravity on our bodies, and believed that imbalances in structure placed demands on the body's pervasive soft tissue network – muscles, fascia, tendons and ligaments, creating compensations throughout the body structure. Dr. Rolf asked a fundamental question: "What conditions must be fulfilled in order for the human body-structure to be organized and integrated in gravity so that the whole person can function in the most optimal and economical way?" Answering this question was a central theme to her life's work, and led to the founding of the system of soft tissue manipulation and movement education called Rolfing®. One of her greatest contributions to the field of bodywork was the discovery that gravity, as an organizing element, is uniquely important for body structure, movement coordination, spatial perception and human expression. To pass along her work to others and make the education process accessible, she developed a series of ten sessions now called the Ten Series. She also coined the term Structural Integration to define her new methodology. It is only in later years, that her name has become synonymous with the methodology and process now more widely known as Rolfing. 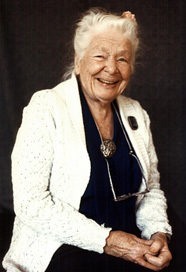 Since her death in 1979 at the age of 83, The Rolf Institute® of Structural Integration and its affiliated organizations including the European Rolfing Association e.V. have continued to share her work by certifying Rolfers™ and Rolf Movement® Practitioners, supporting research, and building upon her inspiration. Dr. Rolf left behind a vital method applied by more than 1600 Rolfers worldwide, and she continues to be recognized today, as a pioneering leader in the fields of soft tissue manipulation and movement education. Dr. Rolf's profound inquiry into how to enhance the whole person by organizing the body in gravity has inspired generations of bodyworkers around the world. She began her exploration more than fifty years ago, devoting her energy to creating a holistic system of soft tissue manipulation and movement education that organized the whole body in gravity. Dr. Rolf discovered that she could achieve remarkable changes in posture and structure by manipulating the body's myofascial (muscular connective tissue) system, and eventually named her work Structural Integration. The Rolf Institute Logo depicts the extraordinary story of a four-year-old boy, Tim Barrett, who was diagnosed with Leggs-Perthes disease in 1959. Tim's mother was advised by doctors to put him in a cast for five years, and it was predicted he would be in a wheelchair by the age of 20. Dr. Ida Rolf believed she could help Tim without having to him put into a cast. She worked on him for several months and he grew up without any handicaps, and is now a healthy, active surfer in his forties. Tim Barrett lives with his family in Hawaii. In the early 1990’s, two profound changes occurred in the evolution of Rolfing protocols. Contact Styles: Rolfing Techniques and methodology evolved. Increased understanding of the nervous system, lead to the introduction of more refined contact styles. The results could be achieved without pain. Working at the level of client tolerance it was discovered, allowed greater opportunities to facilitate change. Moreover, the increase in client involvement also leads to improved ownership of the effects of receiving Rolfing sessions. Non-Formalistic Strategies: Development and implementation of a principle-based approach enhanced and evolved the Rolfing System. Presently, Rolfing's system incorporates many years of proven "recipe" type concepts. In addition, with experience and growing awareness of the Principles inherent in these recipes, Rolfing has expanded by allowing many "audibles" in which clients are better served by specific, individually-tailored session series. In addition, many branches have evolved from the original Structural Integration each with differing interpretations of Dr Rolf's original teachings. These branches are represented by the International Association of Structural Integration (IASI), which continues to promote Structural Integration as a respected, professional identity in the field of healthcare. Rolfing is a rapidly growing profession worldwide; there is also a growing recognition of Rolfing through publicity on international television and the print media. The amount of articles published in magazines has grown significantly. Oprah Winfrey featured Rolfing in 2007/8, Rolfing was discussed prominently in the Academy nominated documentary film ‘Two Hands: The Leon Fleischer Story’, about pianist Leon Fleischer who could resume his career after receiving Rolfing. Scientific research focusing both on fascia and its implications for posture and movement, as well as on studies verifying the positive results of Rolfing, support the vast scope for the profession and its application in a diversity of fields. The Rolf Institute has been at the forefront of scientific research by sponsoring the first ever Fascia Research Congress, held at Harvard Medical School in 2007. Rolfing instructor Dr. Robert Schleip was one of the presenters on his groundbreaking research at the University of Ulm in Germany on the discovery of the contractile cells in fascia – a major contribution to the understanding of the body. The subsequent Congress held at the Vrije Universiteit in Amsterdam in 2009 was even more successful. The next Congress is scheduled for March, 2012 in Vancouver, Canada. The concept of the malleability of the body is highly topical and will continue to spread as more and more people seek Rolfing as clients, and as an exciting career in an expanding field of enquiry.